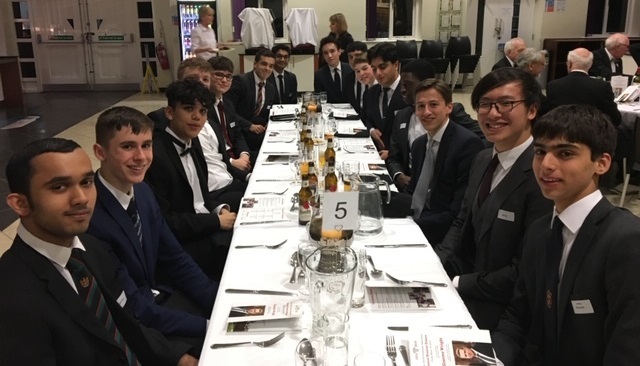 On a somewhat damp and breezy evening former pupils were joined by staff and sixth-formers for the annual Reunion Dinner of the Old Alts Association, held at the school. Old friendships renewed and new friendships forged, it was a most enjoyable and memorable evening. 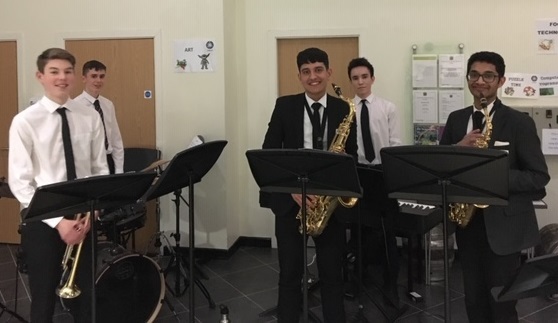 On arrival, guests sampled Dunham Massey Brewing Company beers from the bar (organised by Ashley Cricket Club members) whilst being entertained by an excellent AGSB jazz combo. Sixth-formers were also on hand to show guests round the school. This was a night of both new and old. Formal proceedings began with a welcome by new Chair, Christian James and with the now traditional lighting of a candelabra in memory of former pupil and Classics Master, Reginald Thompson (Buzz). In keeping with a further tradition the Charles Laver Golf Trophy was presented to Ryan Cammack. 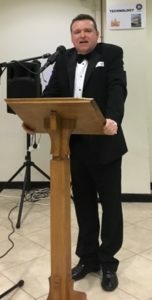 In his preliminary remarks, Christian confirmed that the Old Alts Association committee had agreed to fund the replacement of two dilapidated AGSB crests, one outside the main entrance and the other one in the Coleman Hall at a cost of approximately £2500. Christian introduced the Association’s new President, former Chair Colin Bamford. Colin paid tribute to his predecessor, Peter Morton who had died aged 91. Peter, who attended the school from 1938 to 1944 went on to become Headmaster of North Cestrian Grammar School for 33 years. He was a most amiable man and is sorely missed. It was good to see a contemporary of Peter’s, Hugh Kerridge present at the Reunion Dinner. Hugh had traveled up from Berkhamstead, Hertfordshire where he now lives. Following an excellent meal, Christian introduced our Guest Speaker and third ‘new boy’ Headmaster Graeme Wright. Graeme has now been in post for 7 months and is the ninth Headmaster of AGSB since its foundation in 1914. In his speech the Headmaster recalled conversations he had had with pupils prior to taking up the post. One group of boys told him that the then current Head, Tim Gartside would be a hard act to follow.It was remarked that succeeding Mr. Gartside could be likened to the prospect of David Moyes replacing the acclaimed and highly successful Manchester United manager Sir Alex Ferguson. Graeme had much admiration for the considerable achievements of Tim Gartside and appreciation of his 16 years as Headmaster was shown by a thunderous round of applause. Graeme went on to regale us with a brief insight into his life in the Royal Marines. The Headmaster talked about the school and of his vision for future developments at AGSB. He reported not only the outstanding academic results but also the school’s prowess in other activities such as sport, drama and music. He spoke of his passion to encourage more pupils from disadvantaged backgrounds to attend the school. He also has plans to reintroduce a School house system. 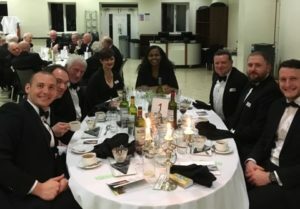 In all, a splendid evening organised so ably once again by Stephen Perrett. 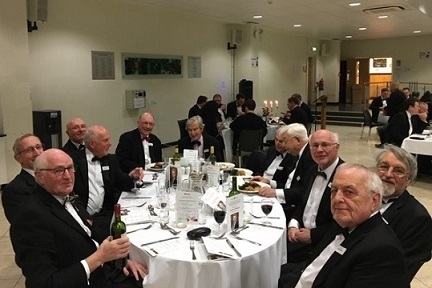 In addition to former pupils, it was good to see so many sixth-formers, and current and retired members of the teaching staff; amongst the latter were Keith Nodding (former Classics Master and Headmaster) and Roger Cleland. 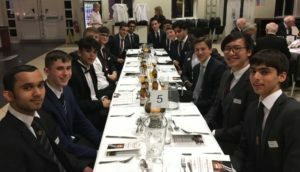 Thanks to the sixth-formers who used all manner of means, including threats of possible future unpleasantness, to encourage purchases of raffle tickets.The raffle raised £475. Although 60 guests were present it is hoped that next year many more former AGS boys will join us for this most enjoyable Annual Reunion Dinner. Keep an eye on the Old Alts website for details as they are announced. 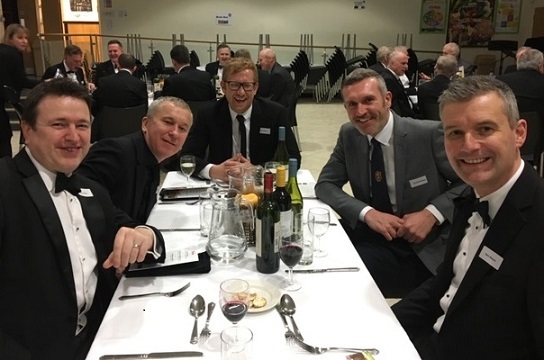 Although attendance was slightly down on last year but that did not detract from the fun, camaraderie ,and renewed pride in this splendid school, Altrincham Grammar School for Boys.